Chasing Boys is the story of Ariel, El for short, who has moved from her swanky school and big house to a new school and an apartment with her older sister, Bella, and her mom. Dad – whereabouts unknown, but clearly he’s left a void in Ariel’s life which she is in desperate need of filling. So, there’s this boy. His name is Eric and he’s a star basketball player and practically the most perfect boy at school. Everyone has a crush on him, but he has a girlfriend. And not just any girlfriend, but the popular and pretty (and, as it turns out, decent and nice) Angelique. Eric isn’t the only boy orbiting El’s life. There’s also Dylan. Dylan slumps in the seat and glances at me. I realize he’s the newest guy at school and I give him my catatonic stare – the one I use when I want the other person to look away. It’s usually pretty effective. He has a thin white scar, almost invisible, that travels from his bottom lip and disappears under his chin, and just for a moment I wonder how it got there. His lips curl into a sneer and I look straight ahead. El tries to balance school and home and her crush on Eric and Dylan’s passive-aggressive interference in her life with varying degrees of success. 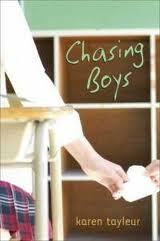 For the teen reader who is looking for a book that is entertaining and not particularly challenging, Chasing Boys will likely fit the bill.